Without BEES pollinating, strawberries wouldn’t exist! This is the case with a third of the food we humans eat. Researchers from the University of California have found that western honey bees are the world’s most important single species of pollinator of natural ecosystems and somewhere between 75%-95% of all flowering plants on earth rely on pollination to survive. Traditional varieties of fruits such as strawberries, raspberries, blackberries, apples, pears, apricots and peaches; all need pollination to bear fruit. Around 2006, bee keepers around the world noticed a huge drop in the number of adult honey bees. There was no evidence of death around hives and the Queen and juvenile bees were found in the hives with plenty of food stores but hardly any adult bees left. This is a phenomenon known as Colony Collapse Disorder or CCD. Since the discovery of CCD more than 12 years ago, studies have been conducted and bee colonies monitored to find the cause. It turns out that there are a multitude of contributing factors. Stressors like pesticides, diesel fumes, modern agricultural advancements and climate change and loss of home and access to flowers, not to mention pests, predators and other natural effects. Though it’s impossible to narrow it down to the number one cause, there are things we can do to help the bees thrive. Even simple things like mowing the grass less often, planting bee friendly flowers in your garden and not using herbicides can make a difference. The bees need our help, in turn we need them. Burt’s Bees has been offering distinctive earth-friendly, natural health and beauty care products for 30 years. From a beekeeper’s backyard in Maine to the leading edge of natural, Burt’s Bees knows natural body care solutions from the inside out and operates with The Greater Good™ top of mind. No parabens, phthalates, petrolatum or SLS and no animal testing. To date the Australian bees have remained resilient to sharp declines, but experts warn it is a matter of time until our bees are impacted by issues affecting their overseas cousins such as the Varroa mite and our researchers need help to get ahead of the threats. 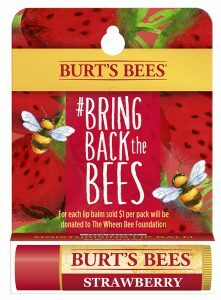 The wonderful people at Burt’s Bees are doing their part to help Bring Back The Bees. In Australia, they’ve teamed up with Sydney’s Taronga Zoo in a new education and conservation program. “As a Champion Sponsor of a unique bee conservation program we’ve committed to a three year partnership that included the installation of a special Bee Exhibit. The exhibit aims to educate guests about bee conservation and the importance of bees to the environment. The custom built observation hive, based on a Langstroth hive, includes a brood box with supers. The hive has custom designed observation windows that provide a lateral view into the hive. A world without bees is unimaginable and we’re committed to supporting our buzzing friends. The partnership is just one of the many global projects that Burt’s Bees supports.” For more on this project click HERE. They’re also supporting our buzzing friends with a limited edition Strawberry Lip Balm pack. For each pack sold $1 will be donated to local Australian charity partner, The Wheen Bee Foundation. This is a not-for-profit organisation promoting awareness of the importance of bees for food security, and raises funds for research that addresses the national and global threats to bees. “We engage with all levels of government, the apiculture industry, bee reliant food industries, universities, research organisations and community. We fund vital strategic research and education initiatives that strengthen honey bees, improve pollination efficiency and increase food security.” Click HERE for more from Wheen The Bees. pdf> (accessed December 4, 2018). Power of Pollinators: Why More Bees Make Better Food”, <http://www.